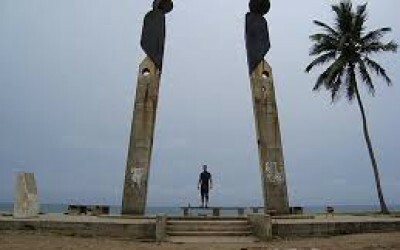 The Point of No Return is situated on an Island off the ancient slave trade town of Badagry. The shoreline has become a relaxation spot for visitors and tourists while speedboat drivers are always on hand to take tourists on a voyage across the lagoon. The place was named ‘Point of No Return due to the fact that in those days, slaves were made to embark on a long and torturous journey where their chances of returning is almost impossible. In those days, slave masters used large rocks on both sides of the road to prevent slaves from escaping into the surrounding forest. It is a beautiful and historic place to visit for tourists, and I trust you don’t want to miss out on it when next you visit the ancient city of Badagry.